From the desk of Ed Freeman. With many experts expecting higher prices, now is the time to accumulate silver. With such great demand, it just makes sense to multiply your silver by simply referring others. Silver Snowball offers you a 30 Day 100% Money Back Guarantee and you can cancel at any time. And, as a member of Silver Snowball, if you ever have any questions please contact me at any time. It is my goal to impress you with excellent customer service. Silver Snowball - The FASTEST WAY to get Silver! A QUICK SIMPLE and FUN way to get more and more Silver! MASSIVE MARKET APPEAL Everybody Loves SILVER! There is a GROWING INTEREST in SILVER! THE MOST AFFORDABLE silver accumulation program on the planet. EASY TO UNDERSTAND - EASY TO JOIN. Start getting silver today! With this incredible silver compounding tool you can forget being left behind in the race for silver! You now have a chance to win by accumulating the silver you have always wanted, but could never afford. Join the Silver Snowball "Silver of the Month" program. It's an easy convenient way to KNOW you are steadily accumulating real wealth. We ship your Silver to you fast and also give you a free website. Send people to your Free website. 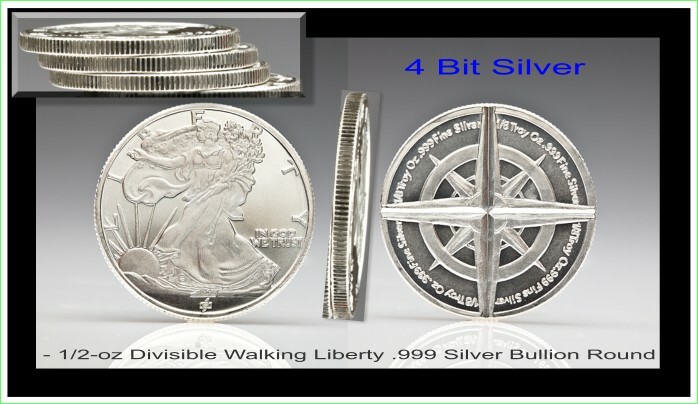 For every 4 Bit Walking Liberty Divisible purchased at your website YOU get more silver. It�s very very simple. You earn 1/2 of whatever your members buy every month � a super generous 50% commission in silver! Subscribers like the convenience of getting silver delivered every month along with SSB News our market timing newsletter. Every bit of silver adds up. We pay you with 1 oz., 1/2 oz. and 1/4 oz .999 Silver Walking Liberty Rounds. Create an inflation proof income. If silver goes up your silver becomes worth more! Accumulate silver without emptying your bank account. Help friends by sharing this opportunity. Grow your silver cache while helping others. Provide security for those you care for. Enjoy having more silver than you ever thought possible. Watch your silver stack up! The simplicity of Silver Snowball is powerful. Once people start receiving silver they want more and more. This can create a growing snowball of silver going right to you from both new orders and repeat orders. Maybe you only want a little silver every month, or maybe you'd like to acquire a few hundred ounces. It's up to you. 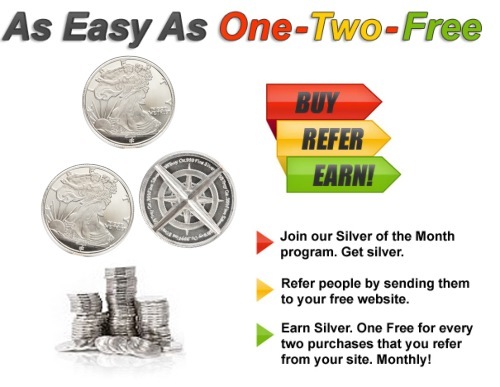 Just join, send people to your website, and receive more and more .999 pure silver. Note to marketers only - There is a growing interest in silver. It's no secret that prices have been rising due to limited supply and more demand. Yet, only 4% of the population currently own precious metals. You do the math. More and more people are becoming interested in owning silver. They need to know about the program where a little can give you a lot of silver. SilverSnowball is a smart way to begin. Feel real money in your hands again. And if you share the good news you can create a steadily growing stream of highest quality .999 fine silver delivered to your door. among the first to hold them. access to my back office. my customers' initial and recurring orders. You get paid on ALL silver sold. I'm ready to get started with Silver Snowball. How do I get Started? 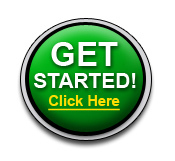 Click on Get Started button below. Then choose whether you would like to receive 1, 2, 3, 4 or 5 Silver Rounds a month. 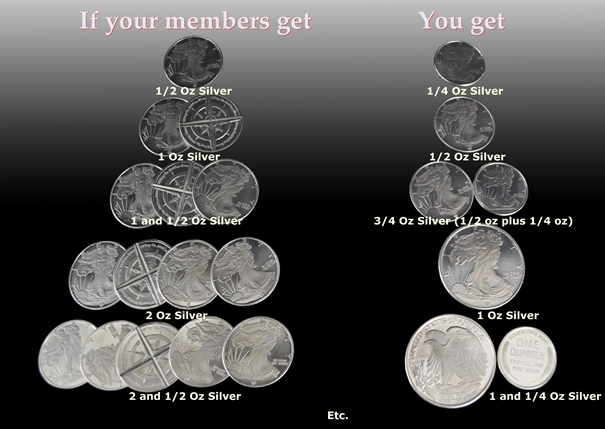 bonuses are paid to members on EVERY silver round sold. Available in USA, CANADA, SINGAPORE, NORWAY, SWEDEN, SWITZERLAND, NETHERLANDS, GERMANY and IRELAND only. 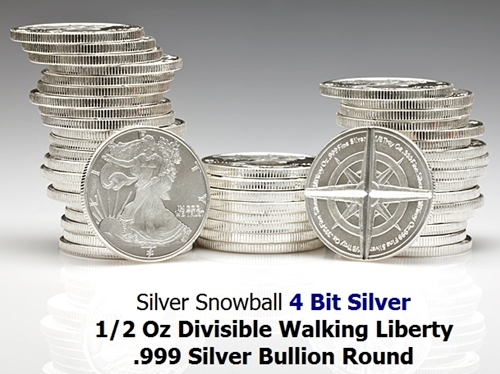 A note about our pricing - With just a few 4 Bit Walking Liberty Divisibles a month being purchased by your members you can be getting silver for LESS than many dealers. Plus you are getting a complete silver accumulation marketing system that can automatically build real wealth for you. Your silver is shipped the next business day after you order. While subject to change due to market conditions at present our Silver Snowball Silver Subscription is only $35.50 monthly + $6 shipping (that's the total shipping rate no matter how much silver you are ordering and there is no shipping charge to receive the bonus silver you earn). 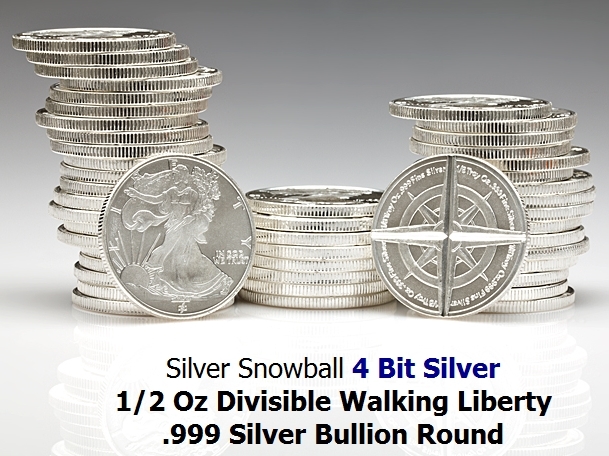 Price includes your 4 Bit Walking Liberty Silver Divisible(s) and SSB News. We also give you a free marketing website and affiliate program that gives you unlimited Bonus .999 Silver based on all new AND repeat customer orders for as long as you remain a member. Satisfaction Guaranteed. Cancel anytime you want to stop your Silver Snowball Silver of the Month. Or, continue and automatically accumulate real wealth every month as your silver collection grows. And, where there is Crisis there is Opportunity. Special Timely Notice - There have been periods of very high demand for silver coins and rounds and very little supply. Shortages have occurred and could happen again at any time. At Silver Snowball we continue to keep the silver coming to you without any delays. How To Get Silver At Lower Prices - The price of your silver acquired goes down as you find people who purchase silver through your website. That's because if you include the free bonus silver you earn along with the silver you purchase your total cost per ounce of silver received is going down. There is no limit how low the price can go. Many members are receiving these "discounted" silver rounds based on our simple marketing / silver bonus system - essentially paying MUCH LESS than getting silver elsewhere. Although we can not know how successful you will be and not every person who joins finds subscribers, we can say that our simple silver getting system works for those who work it. And, there are many who purchase more than one 4 Bit Walking Liberty Silver Divisible a month, happy to just build their collection of silver with our convenient purchasing program. And on top of all that you receive SSB News - our monthly newsletter that said two weeks after the stock market made its all time high that stocks could crash by 50% within two years. We were a little conservative with that call since it only took a year. What's the value of saving our subscribers half of their retirement savings? (No guarantees that every forecast will be correct but many are.) And members rave about our superb, responsive, caring and fast customer service. We answer our emails and phone calls. We want you to succeed. "[This is] a chart of the monetary base (all paper dollars and coinage in existence). It took 200-years for the monetary base to go from $0 to $800 billion, but in just the past 3-months it has grown from around $800 billion to $1.5 trillion, and by the time you read this it will probably be surpassing $1.6 trillion. That's double the number of paper dollars in existence since last summer!" It turns out Mike was a little too conservative as the more recent chart below shows the monetary base has hyperinflated to 1.7 trillion, with no signs of stopping. In Mike's book he shows how past precious metals bull market have continued until the value of the gold ounces held by the government rises in price to equal the value of the currency supply at the time. And this has not even come close to happening yet. "But this time, for history to repeat, and for gold to do what it did in 1980, 1934, and hundreds of times throughout the world going all the way back to Athens in 407 BC, it will require a gold price of over $10,000 per ounce... And that's if they turn off the printing presses today!" And it could happen very quickly. No one knows exactly how this will play out. We want to point out that the historical relationship between gold and silver can reach 16 to 1, meaning that it would take 16 ounces of silver to buy one ounce of gold. At Silver Snowball we've got nothing against gold. But . . . theoretically speaking since we don't have a crystal ball, and there are no guarantees that history will repeat itself like it's done over and over, it implies that if gold were to go to $10,000 an ounce due to the hyperinflationary looking explosion of the monetary base as shown in the above chart it would mean silver could go to $625 an ounce. Or, if the monetary base were to reverse its 50 year trend (possible if the U.S. government stops spending any money and eliminates all U.S. debt), silver might pull back in price. Or, when the public finds out silver is more rare than gold (according to Ted Butler there is about 4 times more gold than silver in the world since silver has been mostly "used up" as an industrial metal) perhaps silver could someday be worth as much or more than gold. According to CPM Group, the total global inventory for silver bullion is 1.9 billion ounces. This includes 711moz in futures exchanges, 38moz government stocks, 941moz in coin form and the rest in inferred & unreported private holdings. Based on the CPM estimate Dr Alex Cowie, the Editor of Diggers & Drillers writes "The world�s silver bullion would fit in a cube measuring just 17.9 metres on each side." What might happen if some (or a lot) of the many silverless people in the world suddenly decided they wanted some of that "cube" of silver? Do you think your silver might become worth more? Isn't it a good idea to get some NOW? Our only recommendation is if you like the idea of getting some silver today and want to build a growing collection you should join Silver Snowball. Join our Silver of the Month program. Get silver. Earn silver. Be in the growing silver business. Start your SilverSnowball rolling and create an avalanche of silver. Please contact admin @ silversnowball . com if you have any questions. We are here to help you succeed and prosper. Order your first .999 Fine Silver right now. Or order two and get an ounce of silver a month. you would like to receive 1, 2, 3, 4 or 5 Silver Rounds a month. 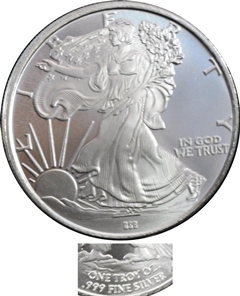 I understand that I will receive monthly one (or more if I choose) 4 Bit (1/2 oz) .999 BU Walking Liberty Divisible Silver Round. I understand that I will be E-mailed updates on money, metals and marketing. I understand that I will get a free "silver builder" marketing website and immediate access to my back office. I understand that I will receive a 50% bonus in silver, paid monthly on my customers' new and monthly silver purchases. And Finally... I understand that I am totally covered by your ZERO RISK, No Questions, 30 Day money back guarantee. Join Now and Start Building Your Silver Today! Available in USA, CANADA, SINGAPORE, NORWAY, SWEDEN, SWITZERLAND, NETHERLANDS, GERMANY and IRELAND only. A note about our pricing - With just a few 4 Bit Silver Divisibles a month being purchased by your members you can be getting silver for LESS than many dealers. Plus you are getting a complete silver accumulation marketing system that can automatically build real wealth for you. We give everyone an easy way to accumulate stunning pure silver rounds and have the opportunity to receive unlimited extra silver bonuses every month. It's a unique and for many, a fun way to watch your silver snowball. Your silver is shipped the next business day after you order. While subject to change due to market conditions at present our Silver Snowball Silver Subscription is only $35.50 monthly + $6 shipping (that's the total shipping rate no matter how much silver you are ordering and there is no shipping charge to receive the bonus silver you earn). This includes your 4 Bit (1/2 oz) .999 BU Walking Liberty Divisible Silver Round(s) and SS News. Note - After your order successfully processes you will be emailed a confirmation that your silver will ship out the next business day. And you will receive the latest version of your marketing website and access to your back office. Join now and start start receiving silver. Disclaimer: The income examples on this website are not intended to represent or guarantee that everyone will achieve the same results. Each individual's success will be determined by his or her desire, dedication, background, effort and motivation to work. There is no guarantee you will duplicate the results stated here. You recognize any business endeavor has inherent risk for loss of capital. While information on this website is derived from sources believed to be reliable there is no guarantee that any opinions expressed on the outlook for silver, gold, currencies, financial trends, or any events in the future will be correct. Past results and trends do not guarantee that future results and trends will be the same.